The 4th Annual Health Fair and Jam the Gym Night at Lister Elementary in Garland was held on Thursday, November 17. This event combines fun activities for parents to do with their children as well as opportunities for families to become aware of health resources in the community. Our hope is that families will have an increased awareness of activities that they can do at home as well as opportunities in their community/school for physical activities that are family focused. In addition, knowledge of nutrition will help students and their families make healthy choices at home and at school. Participants and agencies were asked to complete a survey to identify activities they loved and to help us plan for the next year. About 175 people attended the event. This was about a 22% increase from the previous year. Some of the favorite activities that children could do with their parents were cup stacking, four square, jump roping, hula hoops and bowling. Another big hit was the jump ropes from UTD’s Up-Cycled club! About 60 jump ropes were given out and parents and students were fascinated that they were made from plastic shopping bags. Instructions were handed out so the students could make their own at home. Some of the agencies who participated at the Health Fair included a healthy cooking demo with Texas Agri-Life, the YMCA of Dallas, Garland Parks and Recreation Dept., American Heart Association, American Diabetes Association, Children’s Health the Asthma Mgt. Program as well as the “Get up and Go” program and many others. Another favorite activity we offered was the “I Tasted Five” challenge. The Garland ISD Wellness Coordinator assisted with the preparation of ten different fruits and veggies that were purchased with Healthy Zone Funds. 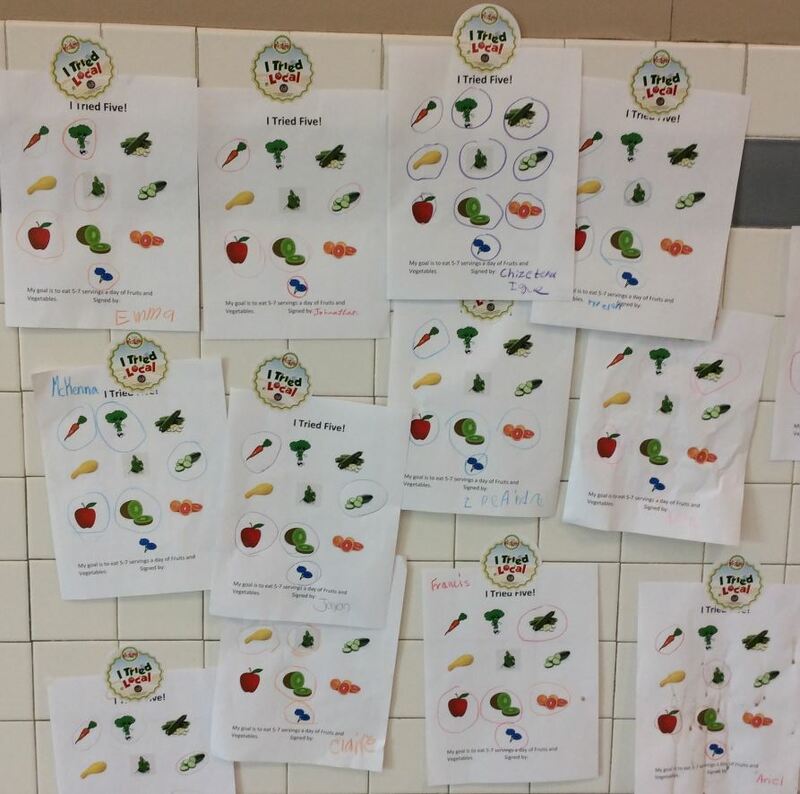 Students were able to sample and circle the five or more fruits and vegetables they tasted and sign a commitment to try and eat at least five servings a day. They then placed them on the cafeteria wall to encourage others as well as remind them of their commitment. Sports balls and a beautiful fruit basket donated by Tom Thumb were awarded as door prizes during the morning announcements the next day. We believe increasing families awareness through education and networking with area health and wellness agencies is vital to the sustainability of any changes in well-being. We are excited about our ongoing partnerships and hope to make a difference in our students and their family’s lives.